The Little Gift is a starter size Picture Keeper with 4GB capacity, which will keep up to 4,000* pictures safe. The Little Gift was designed for sharing with friends and family with the idea to help you “start protecting your memories.” It is perfect for gifting to moms and teachers. Little Gift is available as a single unit (MSRP $29.99) or as a special Four Pack for only $50 (MSRP $119.99). Need a larger size? Picture Keeper also carries PK 8, 16 and Pro with additional picture holding space. Have room for all of your pictures and keep them safe forever! A great idea for Mother's Day is to fill up her Little Gift with pictures of the kids, or grand kids and then she has them on hand for her viewing pleasure and can share them with her own friends. Or give her The Little Gift empty and encourage her to take pictures to put on it, or even put some throw back pictures to share with you. No matter pictures from the past, or present, The Little Gift is a perfect gift for anyone who values memories! 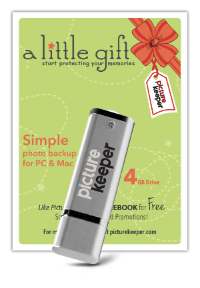 Enter to win The Little Gift from Picture Keeper, holding up to 4000 pictures! I'd give it to my Mom. She has tons of old photos that we are gradually digitizing, more as a backup than anything else. She could also keep her new digital images there, it's perfect. I would use it for all of the baby pictures that I take. I would use this for my photos of my grandchildren and family. I would give it to my mom so she can backup all of her pictues! I really need to back up all my photos, I have been saying this for the past year! I'm a photographer, this would help store all the amazing family photos I take! I would use this to store family pictures, I lost a bunch when our home computer died a couple of years ago. I would give this to my MIL since she has a gazillion pix. Thank you for this chance to win. I would use this to store all my pictures that are on my laptop. That way if anything happens to my laptop I have them backed-up.